Are you curious about vegan food? Always wondered if it’s affordable for you as a student? Here’s your chance to learn more about it! The Montreal Vegan Festival will be hosting its fifth edition this weekend, on Oct. 20 and 21. Given the festival’s success in previous years, organizers had to relocate from Marché Bonsecours to the Palais des Congrès for this year’s event. The Montreal Vegan Festival is one of the biggest in Canada and is free for all, since the organisers want to keep it accessible and affordable. 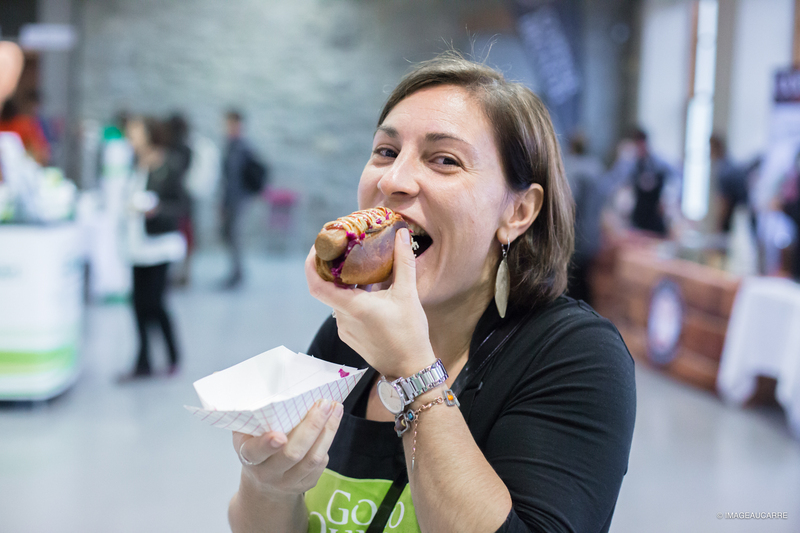 Many activities and workshops will be held in both French and English by well-known vegan chefs—such as Gaz Oakley and Sébastien Kardinal, a French chef and founder of VG-Zone.net, a platform for an array of restaurant reviews, food tastings and new recipes. Jean-Philippe Cyr—known for “La cuisine de Jean-Philippe,” a Facebook page, website, and now a book of recipes translated into English—is this year’s festival spokesperson. Photo courtesy of Danny Payne. Environmental and ethical issues surrounding the food industry are some aspects of veganism the chef wanted to share. Cyr said that, since the 1960s, the world population has doubled, while the population of cows has quadrupled, meaning our beef consumption has increased significantly in that time. He also mentioned issues concerning antibiotics given to the animals we consume. Cyr said the main problem our society faces now is caused by industrialization. “Back in the day, people had a cow and a pig to feed the family; it wasn’t a major environmental problem,” he said. Cyr is a good model for students that want to try to out a vegan diet. He said becoming a vegan can’t be done on the drop of a dime—it requires a period of transition. “I was a classically [trained] chef, already cooking vegan food in a Buddhist temple, but still I was going to McDonald’s like everyone,” said Cyr. When asked about how he began cooking vegan food, he said his breaking point came one day when he had to serve lamb at a funeral home. The atmosphere of the funeral home combined with the fact that Cyr was serving a dead baby animal was, for him, a revelation. “It was an intense connection,” he said. That day, Cyr decided to quit his job. His wife suggested that he start sharing his vegan cooking knowledge online—which Cyr thought was a good idea—so he began to do so on Facebook. Aiming to make vegan food accessible to as many people as possible, Cyr offers alternatives for traditional recipes to help make this transition easier. “My meals are simple and easy to do and are cultural references; spaghetti sauce tastes the same whether you put beef or tofu. There are ways to eat vegan without noticing it,” Cyr said. “I am a chef, not a nutritionist,” he added. If you are on a tight budget, switching to a vegan diet can actually help you save some money. “Last time I checked, chickpeas were still cheap and tofu is half the price of ground beef,” said Cyr. The Montreal Vegan Festival will take place Oct. 20 and 21 at the Palais des Congrès. Jean-Philippe Cyr will give a workshop on how to prepare tofu on Saturday, Oct. 20. On Oct. 21, he will take part in a vegan poutine contest with Sébastien Kardinal. Feature image courtesy of Danny Payne. Marijuana is now legal. What do Concordia students think?